The Man Who Came to Dinner. At PCPA, Saturday, April 14. Kaufman and Hart’s 1939 classic comedy The Man Who Came to Dinner takes place during Christmas, but laughter and wit are always in season. When we join the action, an obnoxious dinner guest, Sheridan Whiteside, has appropriated the elegant living room of the Stanley home in Mesalia, Ohio. 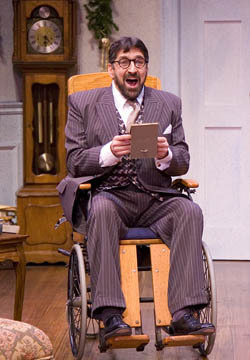 The famous New York critic has injured his hip at the entrance to the Stanley’s home and become wheelchair bound. At first, the Stanleys fawn over their famous guest. “I may vomit,” the arrogant Whiteside exclaims in response to their welcome, but Mrs. Stanley forces a smile; after all, they are the latest news in Time magazine. However, in less than a week, Whiteside has alienated and outraged members of the household with his supercilious attitude. A conscientious, dutiful nurse Miss Preene (Vanessa Ballam) is lectured to, and the hosts are instructed not only to use the back entrance and tiptoe through their own house, but are also prevented from talking on the telephone! To add insult to injury, Whiteside decides to sue the Stanleys for $150,000 (but agrees magnanimously to deduct $800 for the phone bill). David Studwell plays the cantankerous Sheridan Whiteside in PCPA's production of <em>The Man Who Came to Dinner</em>. The greatest martyr of all is Maggie Cutler, Whiteside’s secretary, who falls in love unexpectedly with a local journalist, Mr. Jefferson (Andrew Philipot). Possessive and jealous, Whiteside plans to sabotage their plans to marry. When Maggie sees through his manipulation, she responds with venom equaling Whiteside’s own. Maggie’s protest speech and Miss Preene’s defiant departure drew the night’s biggest cheers from the audience. As Whiteside, David Studwell is energetic and charming with the right dose of irreverent, urban sophistication. He does not accentuate the character’s nastiness, and Kathleen Mary Mulligan responds appropriately by playing Maggie Cutler not only as a hardened, efficient secretary, but also as a hurt, vulnerable woman. Brief roles, such as that of Beverly (Michael Jenkinson), are exquisitely handled by the large cast with style, precision, and expert timing. Heidi Ewart’s Lorraine Sheldon is wonderfully melodramatic (although perhaps not sensuous or seductive enough), and Roxana Sanchez is funny as a mysterious June Stanley, the mad woman in the attic. The enduring appeal of The Man Who Came to Dinner lies in its versatility, which poses a challenge for the actors and audience alike: to accept contradictions and to learn to laugh at one’s own follies and foibles.